As we age, we notice more outward signs of the passing years such as deepening wrinkles, pronounced laugh lines, grey hair, or we pick up our reading glasses more frequently. But with age, we can also experience some health concerns that might not be as visible. If you are noticing concerning health symptoms in your loved one, they might be signs of more serious issues. Here are eleven of the most common aging health issues that you should be aware of. Speak with your General Manager or Health Services Director at your Aegis Living community if you have questions. According to the Centers for Disease Control and Prevention (CDC), almost half of all adults 65 years or older suffer from arthritis. As the nation’s number one cause of disability, arthritis can be a source of acute pain and impact quality of life. Because arthritis can discourage your family member from physical activity, it is important that you work with your their doctor to manage their condition and control any discomfort. According to the National Heart, Lung and Blood Institute, Coronary Heart Disease is the number one cause of death in women in the United States. As the most common type of heart disease in seniors, atherosclerosis is the buildup of fatty deposits and plaque in the walls of the arteries. Depending on where the accumulation is located in the body, this blockage can disrupt the flow of blood and oxygen or lead to a heart attack or stroke. But heart disease is not a normal part of the aging process, maintaining a healthy lifestyle is the best prevention. It is estimated that over two million bones are fractured due to osteoporosis every year in the U.S. With the aging baby boomer population reaching retirement age in the United States, this statistic will rise. The International Osteoporosis Organization estimates a bone is fractured worldwide every three seconds. Women are at higher risk due to the loss of estrogen as they age. In the five to seven years following menopause, women can lose up to 20% of their bone density. There are steps that you can take to prevent and monitor bone loss and bone density. With an estimated 5.3 million Americans with Alzheimer’s disease, the baby boomer population will greatly impact this statistic over the next several years—especially among women who make up almost two-thirds of all diagnosed. 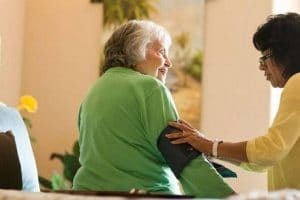 Some of the most common symptoms of Alzheimer’s disease is forgetting recently learned information, repeatedly asking for the same information, relying on memory aides as a crutch, asking a family member to assist with tasks that they normally were able to handle, and confusion about time and place. If you are concerned that your parent or spouse is showing signs of Alzheimer’s disease, speak with your Health Services Director or make an appointment to meet with their physician. Pneumonia is a common and potentially serious illness for the frail. For adults over the age of 65, the annual incidence of pneumonia is four times greater than younger age groups, with a higher rate of hospitalization. It is currently the eighth leading cause of death in the United States. Pneumonia is an acute infection of the lungs and can be caused by a variety of microorganisms, including fungi, bacteria or virus. Approximately one-third of the cases of pneumonia in the United States are caused by viruses. Seniors are more susceptible to pneumonia because of the prevalence of both disability and comorbid diseases. Other known independent risk factors for pneumonia include alcoholism, asthma, immunosuppression, and heart disease. According to the American Diabetes Association, more than one-quarter of the adults in America over the age of 65 have diabetes (types 1 or 2). Approximately one-half of older adults have prediabetes. Among the aging populations, type 2 diabetes is an increasing problem and a disproportionately large number of the newly diagnosed diabetics are elderly. Diabetes requires a significant amount of self-care which can be difficult for older patients to manage on their own. If your parent is diabetic, it is important to understand the barriers—both physically and mentally—so they get the necessary assistance to successfully manage their own care. The medical community has long recognized that the senior population is at higher risk for serious complications and hospitalization due to influenza. Because immune defenses weaken with age, this elderly age group contains the largest number of deaths attributed to the flu. If you are caring for an elderly family member or visiting them in an assisted living community, wash your hands frequently and get a flu shot during cold and flu season. And if you are sick, do not visit your until you are no longer contagious to prevent the spread of the flu. A fall for an older person can be the cause of great concern because it can result in broken bones, abrasions, or worse. There are many factors attributable to a senior’s fall risk, including eye and ear disorders, medication interactions, numbness, joint pain, dizziness, muscle strength, and walking gait. It is important to take precautions to reduce the possibility of falls. In some cases, families find great comfort in moving their loved one to an assisted living community where care staff can help your parent, especially when walking, standing from a seated position, toileting, and carrying items. However, whether a senior is living in a private home or a community setting, fall risks are always a possibility. Poor oral health can affect more than your parent enjoying a family meal. It can be detrimental to their health and quality of life. Tooth loss, gum disease, dry mouth, sensitive teeth, and poor oral health can contribute to significant weight loss, malnutrition, dehydration, pain, interrupted sleep, and communication issues. Although age contributes to oral health problems, there are ways for your parent to care for their mouth. Regular dentist visits are just as important as we age, as they are when we’re younger. According to the National Institute of Mental Health, older adults with depression often show less obvious symptoms and are less likely to confide their feelings of sadness or despair. Also, they are at greater risk of depression if they have a physical illness and medical condition that can make symptoms worse. Therefore, it’s important to recognize the signs of depression to get the help needed. Depression is treatable through counseling, psychotherapy, cognitive behavioral therapy, medication, or a combination of these. Consult with your parent’s physician if you are worried they suffer from depression. There are approximately one million estimated cases of shingles in the U.S. per year. This startling statistic estimates that one out of every three people will develop shingles at some point in their lifetime, and the elderly are particularly susceptible. Shingles is caused by the same virus as chickenpox. It is a painful, blistering skin rash that lasts about two to four weeks. Shingles is common in older adults due to a weakened immune system, stress, injury, certain medications, and other factors. The good news is that most will heal from shingles without recurrence. We are all aware of what we are supposed to do—eat well, stay active, maintain a healthy lifestyle, and see your doctor regularly. But sometimes, that can be easier said than done. Despite our best efforts there are many contributing factors to health issues. These are just a few of the common illnesses you may see in your aging loved one. If you suspect any changes in your parent speak to your Health Services Director, and know that our HSD, Care Director and staff are looking out for your loved one and will share any noticeable changes with you as well.